There’s a post up at Gothamist about a corporate drugstore in Chelsea that turns into a discussion about how that corporate drugstore is so cool, and how it’s awesomeness might help to get independent buisnesses closed. 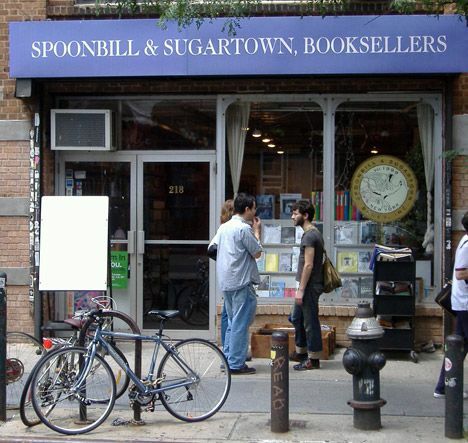 One of those being a bookstore I happen to love, Spoonbill and Sugartown. Seriously, if Duane Reade’s going to pull these slick moves at their forthcoming Bedford Avenue location, then Kings Pharmacy (which closes too damn early!) might as well just give up now and turn into a Barnes & Noble. That would take care of Spoonbill & Sugartown, which would be more useful as a Blockbuster, anyway! I guess this is a case of Gothamist being “snarky”, but I’m not sure.